V1565 – Tom and Linda Platt dress. My initial impression was, ok another dress with a slightly more innovative sleeve variation, but then I saw the Instagram post from McCall’s featuring this pattern and it sort of won me over. There are some beautiful features on this dress, especially the buttons on the sleeves. It perhaps feels a bit mature to me? I’m on the fence if I’d want to buy this pattern, but I can certainly appreciate all the fine details that would go into making a version of it. V1567 – Paco Peralta top and skirt. Another pattern that I can appreciate, but wouldn’t necessarily wear. The drape on the square skirt is pretty dramatic, and the top looks really comfortable. V1570 – I really like the the tops on this Tom and Linda Platt pattern. The draped trousers don’t read well in the photo – perhaps they’d look cooler in real life? – but I do love the black top especially. I’d totally wear that to a holiday dinner or, you know, just because. V1573 – Guy Laroche. Those pants looks crazy, in a good way! Yet I feel that so much of the detail is lost in the garment photo. The top looks… just plain crazy. I’m envisioning it in a futuristic presentation of Romeo and Juliet in which Romeo is really an android and the director is trying to make a statement about the autonomy of sentient computers. Yeah, I’ve been reading a little too much sci-fi lately. V1571 – Anne Klein. Casual, but chic. I like it. The jacket is the sort of boxy silhouette I’ve found isn’t my best look, but the trousers look quite classy. This again might be a pass for me on a personal level, but I think this could be a great fall/winter look. V1566 – Zandra Rhodes. This puzzle-piece dress has a pretty cool seam detail, and would likely be a fun challenge to sew. The dress itself is a flattering silhouette, and could be quite pretty in a fancy fabric. V1572 – I’m always excited by a wide-legged trouser, but I’m not the biggest fan of this peplum top. The ruffle looks too big, and sits just slightly too high. While it wouldn’t be too difficult to switch out the peplum pattern piece, I don’t think there is enough here to get me excited about this pattern. V9277 – Claire Shaeffer’s Custom Couture Collection. While I’d normally dismiss this pattern as being a bit mature for me, and be less than excited by an elastic waist pant, Claire Shaeffer’s patterns are renowned for their instructions. Again, not sure that makes this pattern worth adding to the collection, but if you like the style, the quality of her patterns is usually quite good. V9288 – Very Easy Vogue cape. I actually really like this! The front pockets is a great feature, especially for those of us who live with our hands jammed in pockets through all of winter, and the button details are really sharp. V9289 – Another winner for me! The shape is a bit less tailored and more exaggerated than what I normally go for, but I actually think this could be great for wearing layers and chunky sweaters under the coat. The multiple length options are really great too. V9286 – Vogue Five Easy Pieces. Not the most exciting wardrobe pattern I’ve seen from Vogue, but it certainly looks comfortable and practical for running errands in. V9287 – Marcy Tilton jacket. The collar is pretty cool, and the single pocket is… interesting? I never quite know how to assess the Marcy Tilton patterns. Her style is just so off from my own aesthetic. But it is always a distinctive look, usually with quite interesting details. V9283 – Marcy Tilton. This skirt has some really interesting seam lines and drape. Falls into that “not for me” category, but the overall look is pretty interesting. V9284 – Marcy Tilton leggings. I’m actually really excited by these! The design lines are cool, and would look great with a blouse or long tunic. The elastic waist should be quite comfortable, but the extra seaming details elevate this pattern beyond basic leggings. V1574 – Today’s Fit by Sandra Betzina. I actually like the shape of this peplum jacket. It has some nice design lines and interesting collar design. V1569 – Today’s Fit by Sandra Betzina. Hard to tell, but it sort of looks like a poncho style topper. Not much excitement in terms of style lines, but the high collar could be very warm and practical during the winter. V1568 – Today’s Fit by Sandra Betzina. Not much of excitement in this tunic either. The plan one is rather basic, and the ruffled one is not my favorite look. V9281 – Very Easy Vogue. I really like the neckline of this top, but I’m a little less excited by the shape of the peplum. I’m thinking that maybe I could extend this into a dress, or un-peplum the top, or something. But I’m definitely getting this just for the top part of the pattern. V9285 – We couldn’t entirely be done with the voluminous sleeve trend, but it is certainly less prevalent in this collection than in the others this year. Of course, having such large sleeves isn’t the most practical for heavy coat weather, so that could be part of it. Anyway, this top is fine, but really similar to the other 50 versions we’ve seen so far this year. V9280 – Vintage Vogue. This vintage Vogue coat is beautiful. Look at the back pleat! And the front seaming. Gorgeous. Totally going in my shopping cart at the next pattern sale. V9278 – Very Easy Vogue. Looks like we’ve got more 90s inspired looks heading our way. Nothing offensive here, but nothing exciting either. Sort of blah. It does have cup sizing though, so that’s nice. V9279 – Very Easy Vogue. This dress is cute, with lots of great seam lines for fit. The sleeve ruffle is rather tame, and ties in nicely with the neck bow. I think it’s too sweet for me, but I think this dress could be quite cute and I hope we see versions of it pop up on social media. V9282 – Love these pants! The button detauls on the hem are something I remember seeing in the August 2006 Burda, but it’s a cool feature, especially on the culottes. I think I might make every version of this pattern though, because the style and details are fantastic. V9291 – Kathryn Brenne. These wraps definitely bring the drama! I’m partial to the green one, but I could see the others pairing well with sleeveless evening gowns. V9290 – Ron Collins. I love this! The seam details are perfection. It’s like a sweatshirt, but way more stylish. Definitely a great addition to the Vogue men’s line. And that’s it! So, like I said, there are a lot of styles that I find interesting, but I’m not particularly liking for myself. I’ve noticed lately that I’m a bit more discerning when it comes to my pattern purchases. Partly I think it is because my stash is reaching critical mass – there isn’t a whole lot of growing room available – but I also think it may partly be due to the research I’ve done into style typing systems. When I do these pattern preview posts now I can’t help but mentally classify looks as being “too dramatic,” “too natural,” or “too gamine” for me. On the one hand I don’t want to limit myself or dismiss patterns as being “bad” when it’s really just a matter of personal preference, but on the other hand I’m sort of happy because I feel like I’m settling into defining a personal style. I’ve actually been thinking about doing as post on the style typing classifications and relating that to various pattern releases, though it is just a thought. Anyway, on the whole I found that this release has a lot of interesting details and bold shapes, but perhaps a more mature overall feel to the whole collection than I’d choose to wear for myself. Certainly there are a few patterns I’ll be picking up, but personally I think I could easily give most of this collection a pass. What do you all think? Are you super excited by these patterns? Or will you be skipping out on this release? Do you often feel appreciation for patterns you don’t buy because you know they won’t work for you? Or do you buy what you like and make it work? Feel free to discuss in the comments! Two ugly collections in a row. I haven’t bought any Vogue patterns since last summer. “Mature” is putting it mildly for this sad offeringd. It’s just plain frumpy. No exciting holiday evening wear. Nothing fashionable stores would sell. Vogue needs to get rid of their lousy in-house designers and hire some who can produce the runway couture styles that made them famous. The funny thing is that the designer patterns were just as matronly as the other looks. I actually like more of the generic Vogues than the high end designer looks this time around. Yes! I was just sad you can’t see *any* of the detail in the photo. This collection is a pass for me, with the possible exception of the man’s jacket because how often do you see those. I’m even skipping the Anne Klein coordinates and I usually buy all the Anne Klein patterns because the jackets are so wonderful. But this jacket looks so 80’s. And the pants look so 50’s. The whole thing just doesn’t look right to me. It’s something my aunt would have worn in the 70s by putting together her husband’s jacket and her old pants. Right? I feel like this whole collection feels so dated, except the Man’s jacket which looks so modern. I’m totally getting the wide legged button pants too, but I have a weakness for pants like that. And the vintage reprint, but that’s *supposed* to look vintage. I have half a dozen on the way to me! I loved this release! I didn’t care for any of the coats and so far didn’t pick up the Tilton patterns; but man her patterns are so well done and those quirky details shine. I did pick up a few at the sale today. Not as many as normal, but I’m sort of ok with that. A bit Marmite for me. I love the Guy Laroche and the Paco Peralta. I liked the Zandra Rhodes dress but won’t be buying it because realistically I’ll never make it. Good trouser and leggings patterns too, and the non-vintage coat is great, but the rest left me totally cold. But even if I’m buying only two patterns that’s more than I have from the last few releases. I wish they’d do more designer collaborations but don’t we all? Thanks for another detailed and inspirational post. I can totally see why you are not won over, a lot of the designs just don’t seem practical. They seem like the kind of thing you would buy, spend a lot of money and time on, make and never wear again!! I did like those styles a lot too. Hi, I have been reading your blog awhile. Decided that now is a good time to chime in. The designs seem to be overly whimsical for me. I work in a rather conservative office. I could not see myself wearing these to work. I’ll probably grab the Claire Schaffer and Anne Klein patterns. But that is all. The red dress that starts off the collection is striking, but as a petite, I would find it overwhelming. The top of the Paco Peralta (V1567) is nice, but the skirt would be another overwhelming make.I do like the Marci Tilton seam detail pants, but I already have two seam detail pants patterns so I won’t be buying this one. Also, I find so many of her styles irritatingly crazy that I probably won’t ever buy one of her patterns. I like the pants in Guy Laroche V1573, but won’t have time to make them. I also like V1571, the Anne Klein pattern, but I’m probably not going to pick it up unless I get through a good bit of my sewing pile. Overall, I would not say the styles are matronly so much as that they only apply to very specific body types, usually tall and thin. I could see that. Agreed that there isn’t a lot for different body types in this release. Thank you for the review! I found myself thinking about 9285 (top with gathered neckline) as a creative option for special occasion outfit in festive fabric. Something about the combination of that neckline and dramatic trumpet sleeves caused me to envision it this way. 9279 (pink dress) stroke me as being too simple as if it is completely detouched (in my view obviously) from the collection and feels outdated. I like the men’s jacket by Ron Collins! Stylish cut with clean simple lines! Everything else is not my taste. 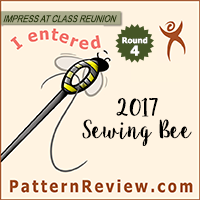 I was so rooting for you to win the Pattern Review Sewing Bee and was bummed for you. Every single one of your 4 entries were prize worthy! Awww, thank you! I sort of felt that my final round entry didn’t quite read the way I had hoped in photos, so I wasn’t surprised or disappointed with the results in any way. 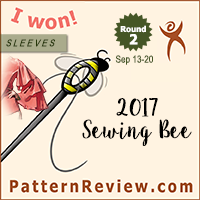 I’m just super excited to have won a round and to have made it to the finals! I’ll probably do a recap post after the shell shock has worn off a bit, but it really was a great, fun experience.